As a basketball player you hear all the time that defense is about heart. Being good a defense is a choice, you just have to want to stop the opponents you’re playing from scoring. While there is a great deal of truth is these “basketball sayings”, there is another aspect that many coaches fail to mention or might not even understand. Many coaches fail to realize that their players might simply have enough flexibility and range of motion (ROM) to get into and stay in an effective defensive stance that allows a player to maintain their balance and keep their body in front of the offensive player they are guarding. Below is a link to an article from Bleacher Report about Patrick Beverley, guard for the Houston Rockets. Above the article there is a video of Patrick Beverly playing some lockdown defense. Followed by an interview in which he explains his defensive mindset, and what makes him a good defender. In the interview Beverly talks about “moving well laterally” and the fact “no one likes pressure”. Two important aspects to being a good defender. To move well in a stance and to stay on balance requires a player to have proper ROM in their hips. Without the ability to move your hips well you will always be limited on defense.To be a good defender you must also be able to change direction quickly in all planes of motion. Below is a routine to help your tight hips in a context that applies to an efficient and effective defensive stance. 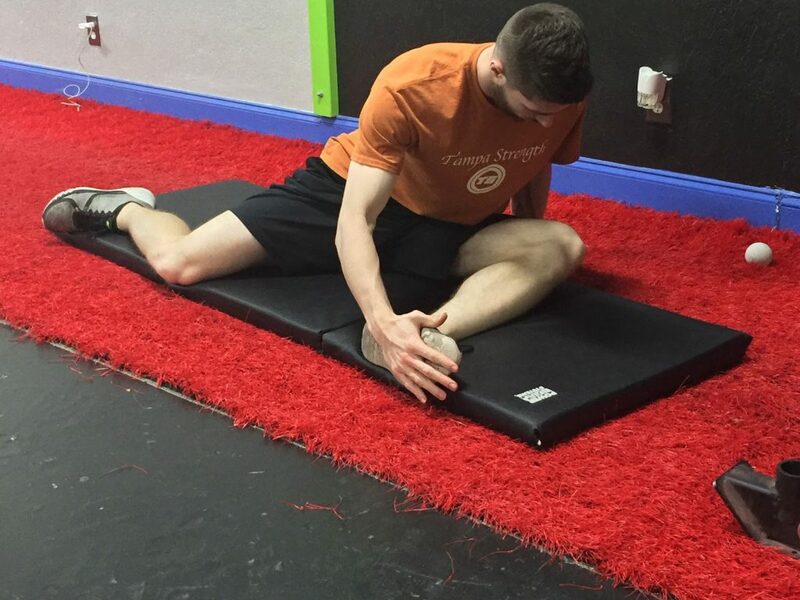 This could be good to use as a warm-up or added mobility work while you are recovering. Even though this routine could help to solve some problems please take in mind that it could be something else that is limiting your movement, however the hips are a good place to start. Also consider that both of your hips might not be equal in terms of ROM and strength, so take that in consideration. Sit on a lacrosse ball with your body angled slightly towards the ground on the side of the ball. 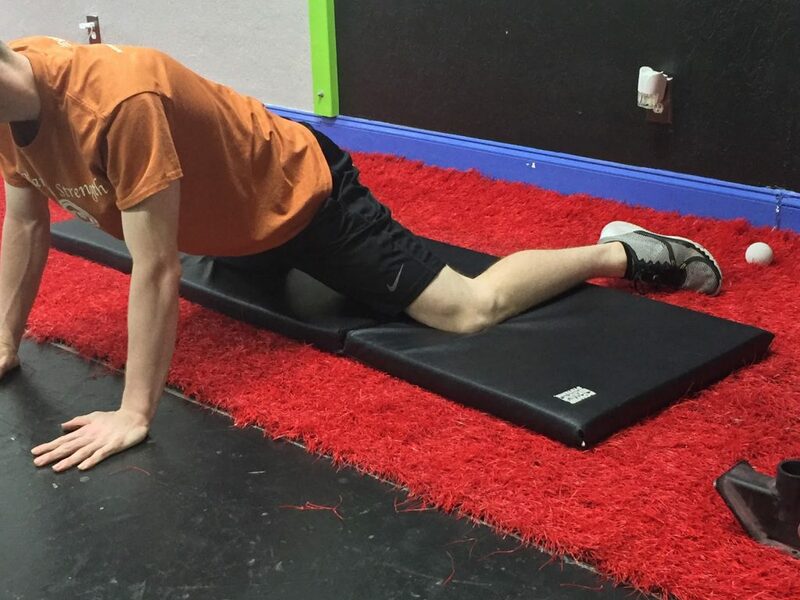 Roll back and forth trying to find tender spots around your glutes and hip. When you find a spot that is especially tender stay there and rotate your hip outwards and inwards 5-10 times. Repeat on a new spot, stay on each side for 1-2 minutes. 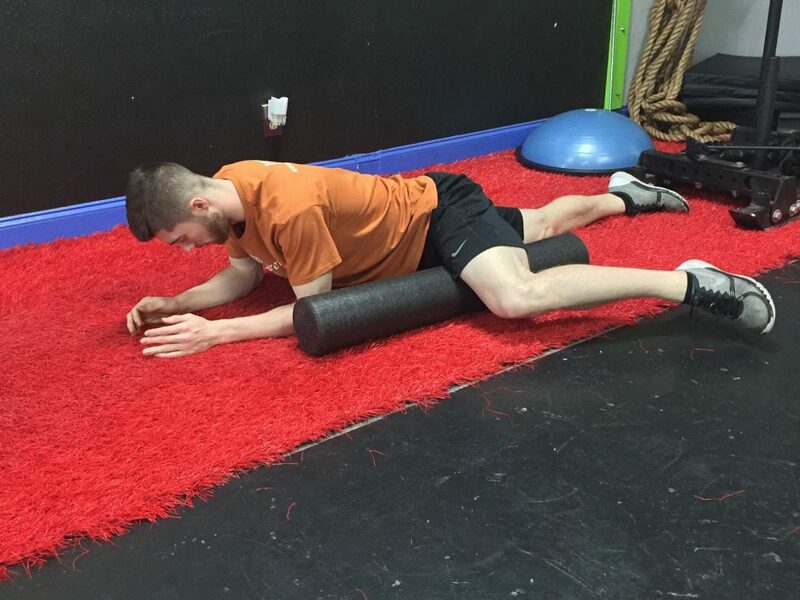 Place a Foam roller on the ground lay your leg closest to the roller on the roller with your other leg on the ground. Roll from knee to the inside of your groin. When/ if you find an extremely tender spot stay and roll back and forth other that spot for 5-10 reps. Go 1-2 minutes/ side. Get on all fours with your shins and ankles on the ground. 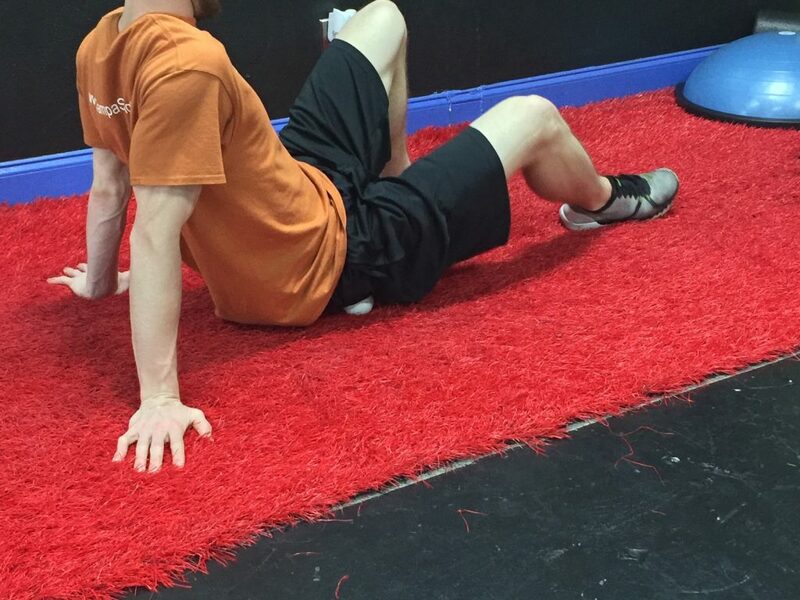 Actively push your inner knee and ankle into the mat for 5-10s. 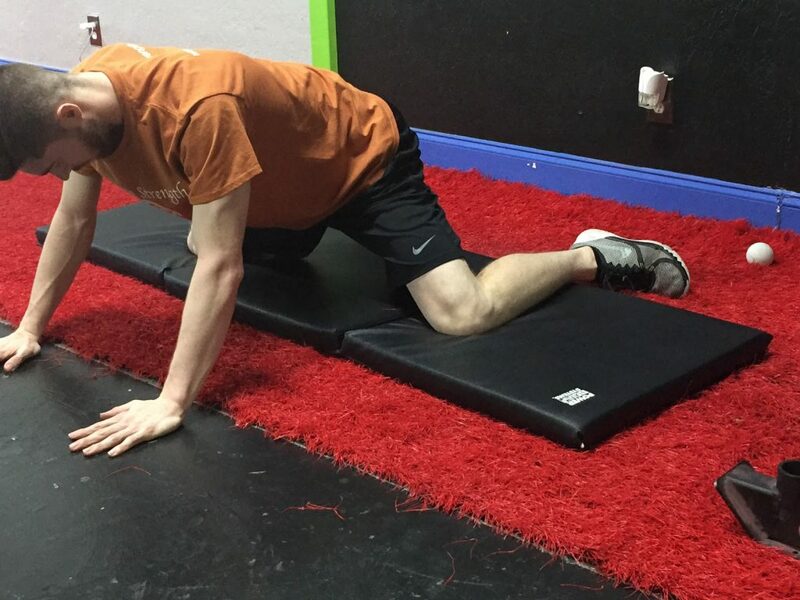 After that sent your hips forward trying to touch them towards the ground hold for 5-10 seconds. Repeat for 1-2 minutes or 10-20 repetitions. 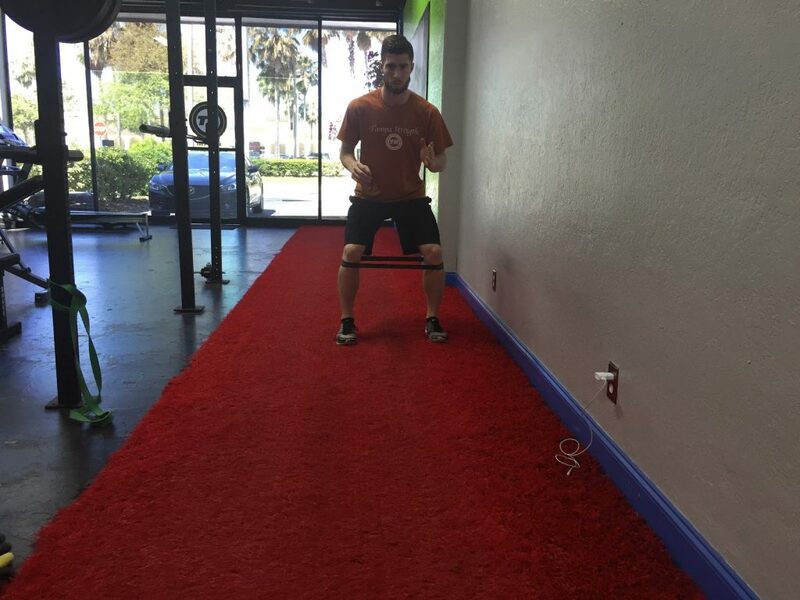 Go into a long lunge with a band around the leg in front of your body. Flex your glute on the side of the leg that is back. Allow the band to pull your forward hip and knee outwards while keeping your foot flat on the ground. Hold for 1-2 minutes/ side. Sit on a mat with your front and back leg both a 90 degree angles. Grab your front foot with hand on the same side as the foot. Straighten your back out and lean towards the front leg. Hold for 1-2 minutes and repeat on the other side. Place a mini-band around your ankles. 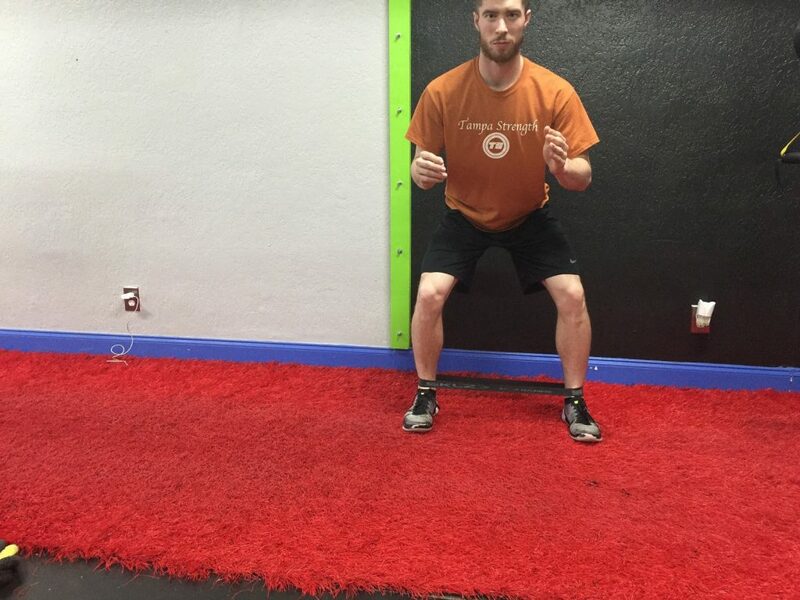 Get into a defensive stance with your feet and knees pointing forwards. Walk sideways staying low and keeping tension on the band at all times. Go 15-20 steps one direction and then repeat the other way. 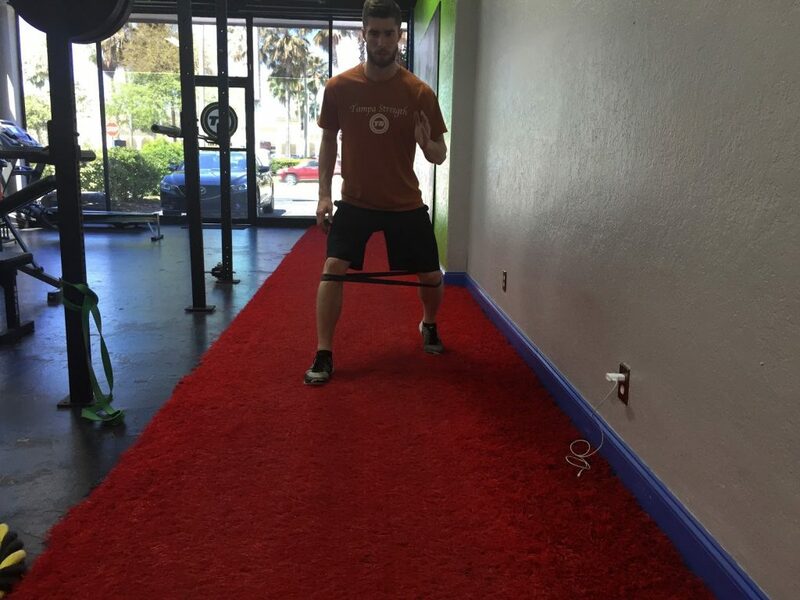 Place the band just below your knees with your feet shoulder shoulder width apart. Go into a half squat position and then walk forward stepping out and forward with each step. Make sure to stay low and keep tension on the band. Take 20-30 totals steps and repeat walking backwards. 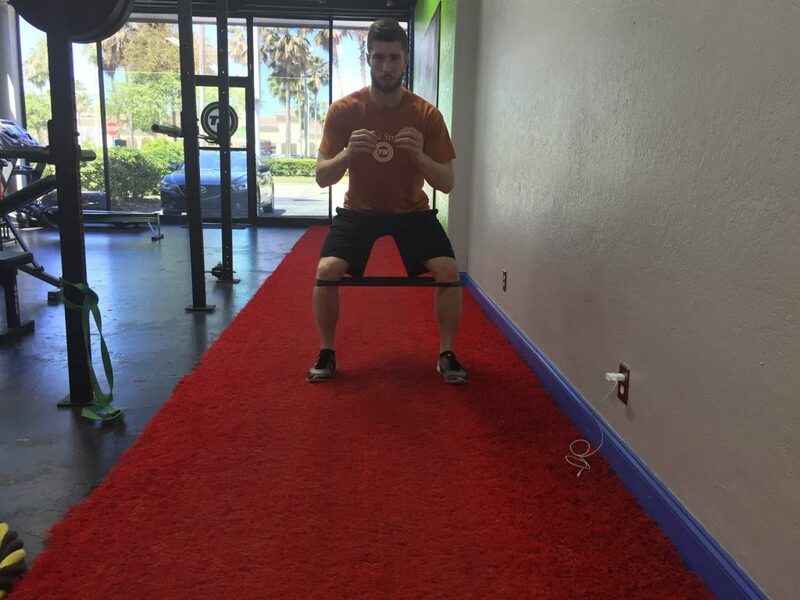 Keep the bands around your knee and go into a squat position while trying to pull the band apart with your knees. Make sure to keep your feet pointed forwards Hold for 20-45 seconds or until fatigued. This circuit done a 2-3 times a week, or more can be good start to getting more mobile hips and a better defensive stance. It can help your knees from inwardly rotating (knee valgus) which can set players up for nagging knee pain and even serious injury. 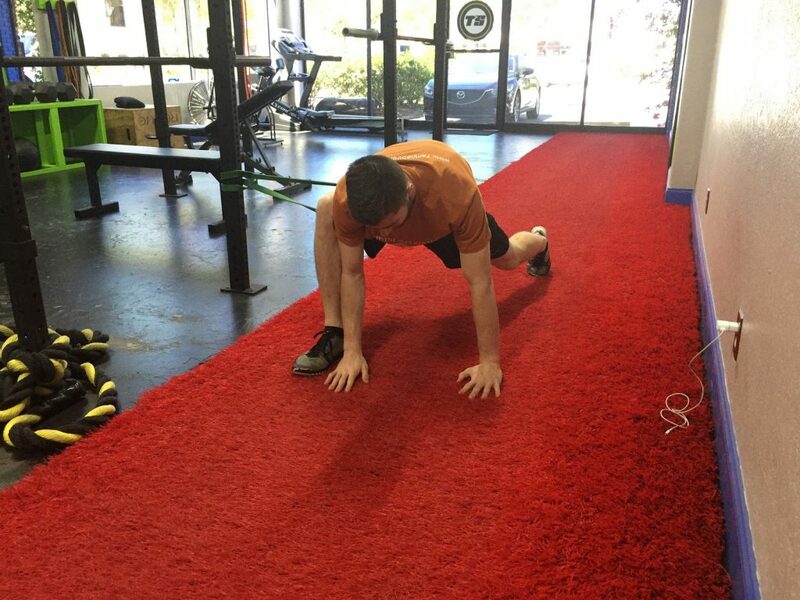 At Tampa Strength mobility is foundation of our training, especially with our basketball players. Without complete ROM you are doing yourself a disservice as a player and robbing yourself of athleticism. We also make sure that our athletes are set up to move optimally within their sport. 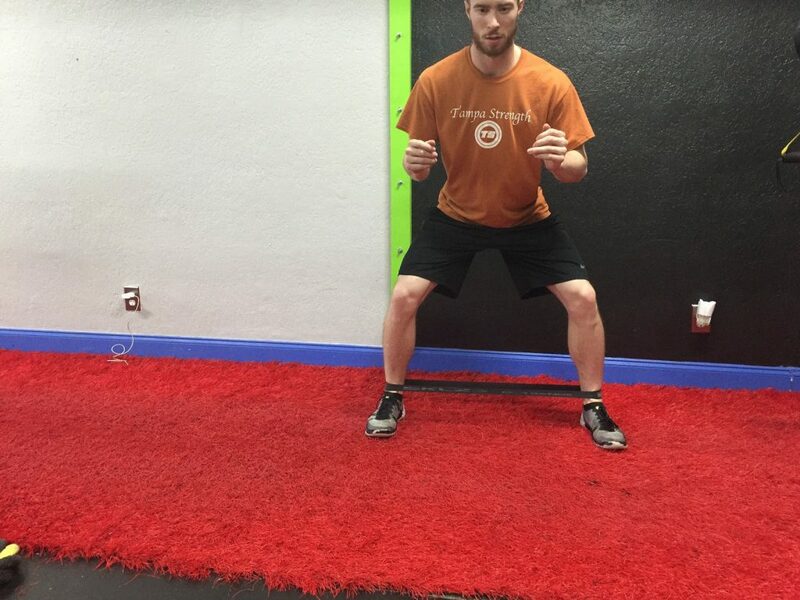 If you are interested in training with us and tightening up your defensive stance please contact us at john@tampastrength.com.